Chinese Pistachio is a splendid deciduous tree with bright green, alternate, pinnate, compound leaves. During the growing season, its foliage has an attractive deep green color, and in fall, the tree will display spectacular colors ranging in shades of crimson, bronze, orange and red. Pistachio is native to Taiwan and China. As such, it is a popular plant for landscapes and roadsides. On a historical note, Chinese Pistachio was one of Confucius’ (Chinese philosopher, 551b.c.—497b.c.) beloved tees. To commemorate this great philosopher, a lot of pistachio trees were planted in CHI Fu Temple in an area known today as Confucius’ Forest. In fact, the oldest known sculpture of Confucius was carved out of Chinese Pistachio wood by his student, Tzu-Kong, about 2,500 years ago. Because of the significance Chinese Pistachio has to Confucius and Confucian Philosophy, this tree has historically been called Confucius Tree. (Chinese Pistachio) 名”孔木”, 源於曲阜孔廟前”孔林” 遍植此樹种, 又相傳孔子首度的彫像由子貢以黃蓮木彫成. 黃蓮木老木心材常腐朽而成空洞, 故又名蘭心木. 大陸華中以南各省均產之, 臺灣從平原到1000公尺左右的山區, 到處皆可見其自生. ; 近年來並大量种於庭園景觀和行道, 如高雄市文化中心前五福路, 台中市科博館大門左右二棵 和植物園四週. 落葉喬木, 奇數羽狀複葉, 小葉7至10對, 新芽鮮紅. 夏季鮮綠, 冬季由墨綠轉金黃而終呈深紅色, 色澤繽紛, 美不勝收. 花為圓錐花序, 赭紅色, 核果狀果實. 台灣培植黃蓮木盆栽超過50年, 先人不甚了解樹种特性, 雖有不少佳構, 但大多荒廢, 殘存老樹非常稀少. 近二十几年來多位盆栽家潛心研究, 終於了解樹性與維護要領, 老樹得以保存, 新作更將持續發展. 必須將新芽以鋁線調整到正確方向, 然后任其徒長變粗, 再剪短. 新芽再調至正」確方向. 每年約2到3次,如此不斷重覆三年. I got this particular tree in early 1990. After countless hours of refinement, the second picture was taken in 1993. By then, to my knowledge, all the basic elements were ready. 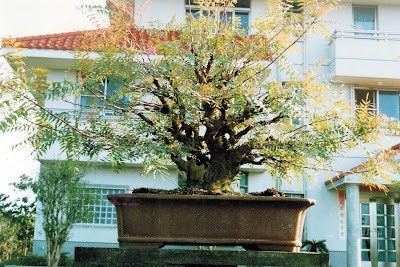 In order for it to grow quicker, I placed the tree in a larger pot in 1996. 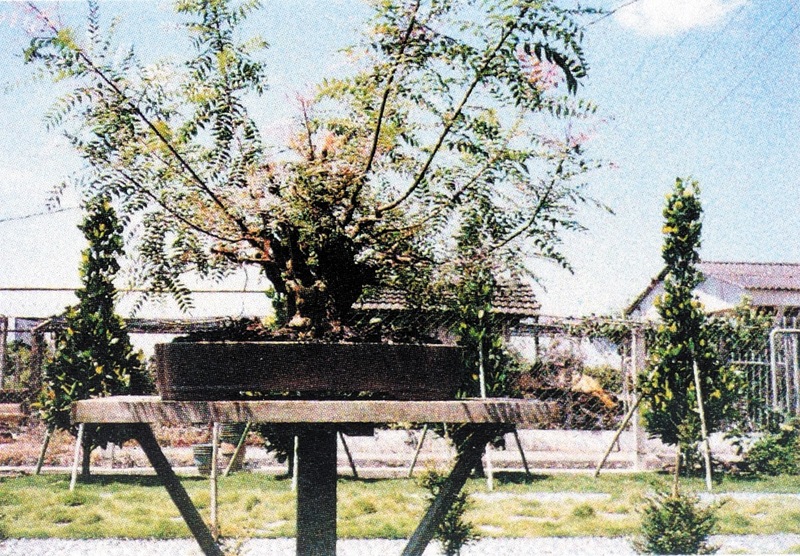 By 1998, my Chinese Pistachio won the grand prize in the Taiwan Bonsai Creators Association, and in 1999, it was again the Grand Winner of the Japan Airlines World Bonsai Contest. 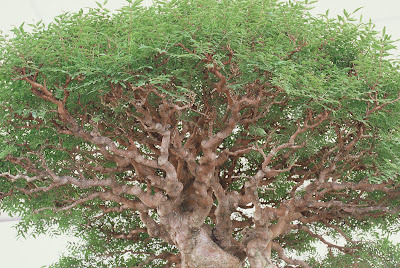 This bonsai was shaped by using both using the Clip-and-grow (Ling-Nan) and wiring techniques from Japan. By progressive periodical cuts, I make the branches ‘zigzag’ to represent an energetic, strong illusion. All new branch lets are wired to the right direction to achieve a harmonious design. 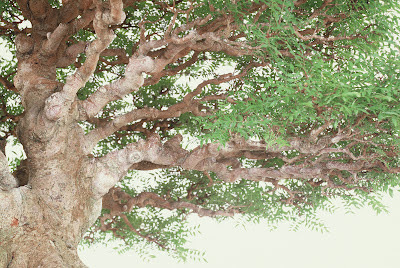 Combinations of these basic and advanced techniques will result in an enchanting tree which looks very old and huge. Winter color was taken in January 2001, right after the Taiwanese New Year. During this time, a lot of friends visit my garden to enjoy the wonderful colors and to pray for health and wealth for the forthcoming year. As you can see, the root system spreads in all directions, giving the illusion that it’s stable enough to withstand a typhoon or hurricane. Every root is different in size and taper, just like the branches. The big root on the right hides in the ground, and then multiple small surface roots emerge, representing the mystery image of a hidden dragon. The same happens in the left side. A powerful trunk rises from the base, then diversifying into many marvelous multiple branches. This is the result of superior construction in support of the story about endless age. Proportions are the key to represent a bonsai that looks huge, although in reality, it is indeed small. If the proportions exceed one (1), the bonsai will be nice. On the contrary, if the proportions range in minus one (1), the bonsai will not be good. The tree in both images measures less than 60cm, but has a spirit of a tree many floors high!!! This is the true awakening of the soul of an old huge tree. 分析這黃蓮木, 可將圖像任意切割成許多部份, 每一枝幹都像一棵樹, 更像山水畫中的參天古樹. 些許文人, 些許古典；每個節間的頓` 挫, 每段線條的變化, 都是書法美感的再現. 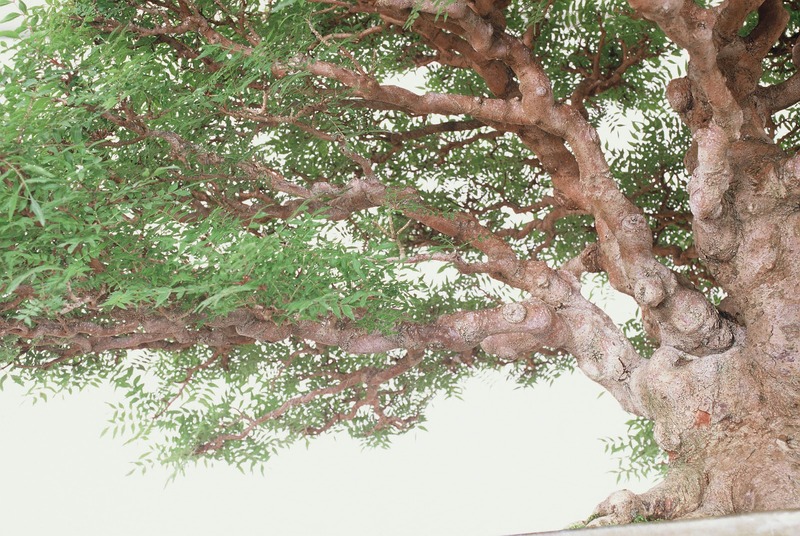 As bonsai is the personification of nature’s beauty, it should be viewed from all sides. (See image7& 8) By closely observing the back portion of this Chinese Pistachio bonsai, one can observe the history of a tree that has undergone countless adversity. This character enhances and evokes patience. The outstanding ramification represents the rhythm of the natural environment. 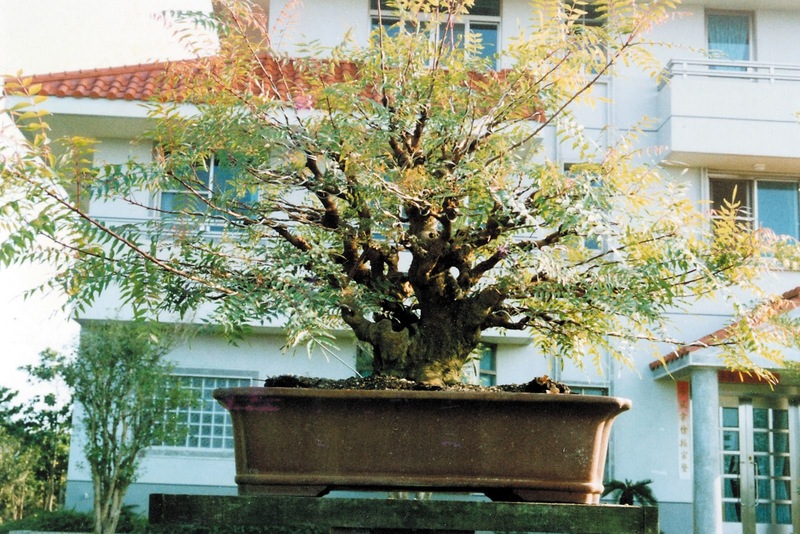 In Taiwan, Chinese Pistachio has had a bonsai history that exceeds 50 years. Unfortunately, many bonsai enthusiasts experienced hardships in cultivation methods, resulting in the death of many wonderful trees. As a result, I will like to share my experience and knowledge on how to properly cultivate Chinese Pistachio. Chinese pistachio can be easily found along the seashore and in altitudes of 2.500m in Taiwan. Formerly, it was easily collectable in riversides & forests. Unfortunately, the government prohibits its collection. Availability is now limited to plant nurseries. Chinese Pistachio can also be easily propagated from cuttings, seeds and air-layers. 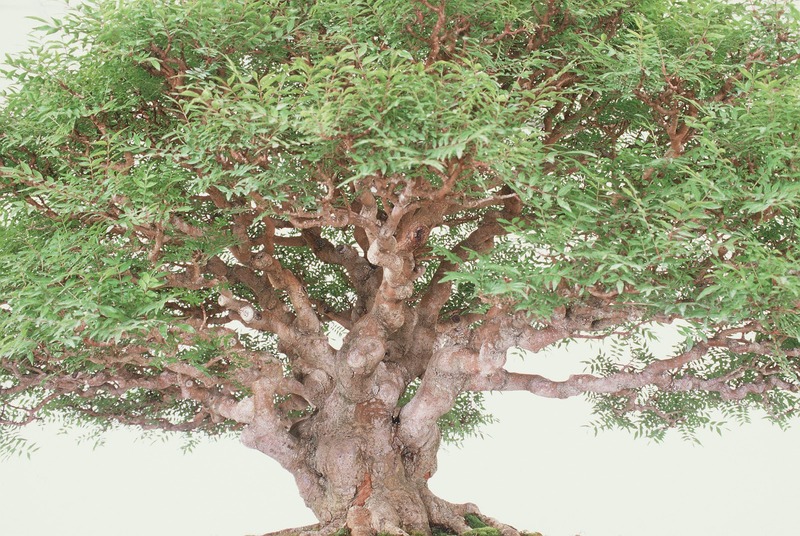 To my surprise, I saw many two to three year old trees available in the vendor area of the 2005 Golden State Bonsai Convention in California, so imagine it should be easily found in the United States. Chinese Pistachio tolerates drought, wind, salt, and heat well when planted in the open landscape, but when in a pot, tolerance is frail. As its roots grow rapidly, it is often necessary to transplant frequently. The best time is in early spring right before the new buds begin to sprout. This is an imperative step in order for an established Pistachio bonsai to maintain its rich ramification. Release the soil surface near the root system or the rim of the pot in order to let water and air transpire easily in late summer to make the tree more vigorous. 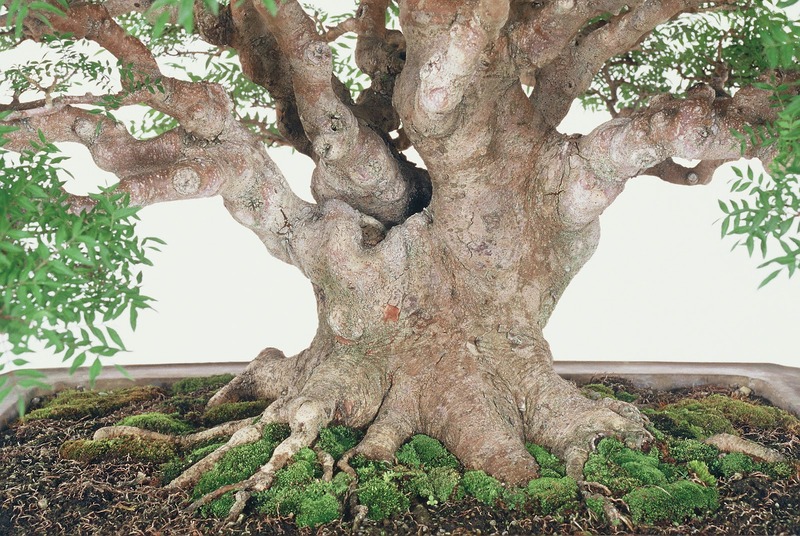 The soil medium in undeveloped bonsai should be composed of 80% coarse sand and 20% humus. In developed bonsai, the proportions of these two components should be in equal parts. (50% coarse sand; 50 % humus). Alternate, pinnate compound leaves require considerable amounts of water, specially in summer when a second or even a third daily watering might be necessary. 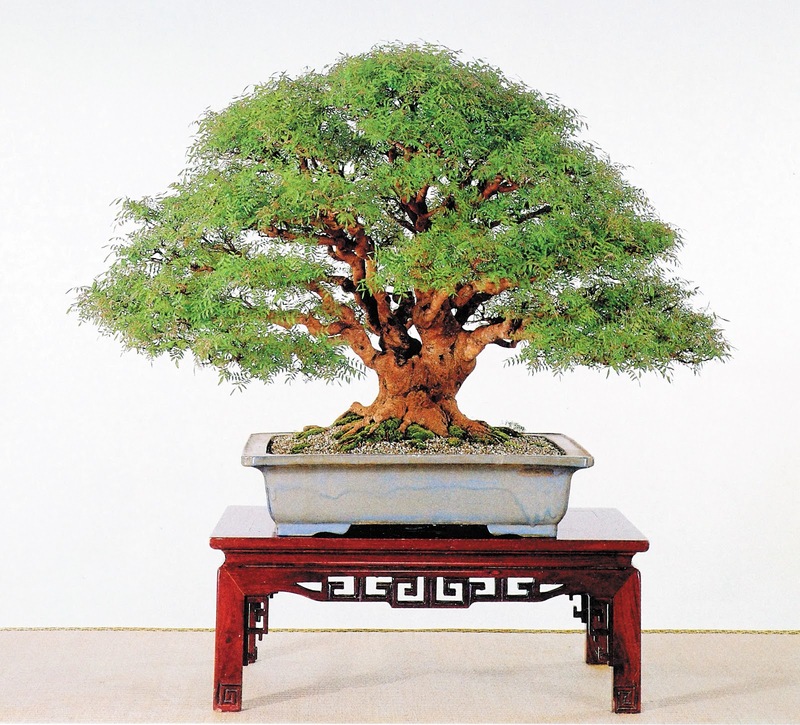 This is so because high temperatures may cause dense ramification of established masterpiece bonsai to wither and dry out. When they are sprouting in spring, they require more water than other deciduous bonsai due to the fact that their leaves grow much faster. In autumn and winter, Pistachio needs a daily shower because they continue to grow. If leaves due drop off, water less. For a freshly transplanted tree, fertilizing should begin 30 to 40 days after the leaves have turned bright green in color. This is done once a month until October or November, stopping also during rainy season. Undeveloped bonsai are fertilized every twenty (20) days during the growing season. 水份: 黃蓬木葉子非常溥, 且葉片多水份散失快, 故需給予充水份. 夏天每日至少澆水二次, 春天新芽剛長, 亦須給予充份水分. , 若水份不足, 輕者葉稍局部枯萎. 重者造成枯枝. 肥料: 未成品者須給予充份有机肥, 成品者每月施予薄肥. 秋天則需足夠肥料, 冬天方可有燦爛的色澤. Aphids attack the plants occasionally in early spring or during rainy season. This will be a proper time to spray with pesticides. Coccids also present a problem and are extremely dangerous for Chinese Pistachio. We should examine every branch and twig to be alert of their presence (white powder) and protect the trees, if not, the tree will weaken and die back. 消毒: 黃蓬本少有病虫害, 唯常見介殼虫侵襲. 通常於夏末剃葉整姿, 將全樹徹底洗淨. 冬天塗佈石灰硫磺合劑稀釋液, 並置放於通風處, 即可減小虫害發生. Defoliating is a good practice to induce and increase ramification and twigs. Remember, remove and wash off all organic or chemical fertilizer one week prior to foliage removal to prevent residual damage to the root system. Defoliating twice a year is advisable towards the middle of July while the tree is active. When temperature is high, transpiration is at its highest peak, so defoliating at this time will allow the tree to gain vigor again. 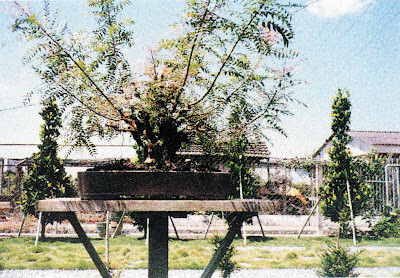 After defoliation, the tree should be placed in semi-shade for a period of three to five days, only moving the tree to full sun after the buds have come out. After this, for period of approximately 12 to 24 days we should be able to enjoy the dynamic fresh red-bronze color. Actually, if you are getting a tree ready for display or pictures, day 15 is the peak day for color. In autumn, it’s advisable to defoliate again in order to preserve energy for the forthcoming winter and to induce better fall color. In Taiwan we defoliate in the end of October, to increase fall color in December or January. After defoliating, one should clean and wash the entire bonsai carefully. 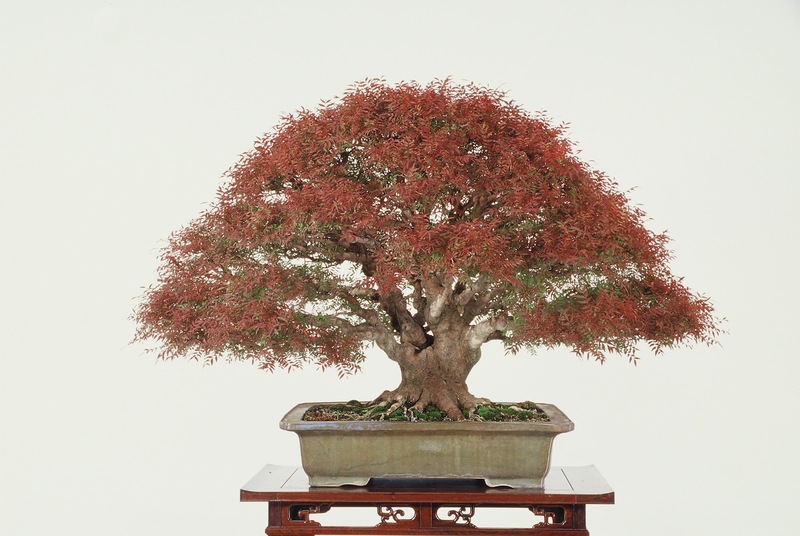 Chinese Pistachio is a gift from nature to all bonsai lovers. The dynamism of this species makes is a perfect candidate for bonsai culture. The ever changing nature and colors of this tree remind us of the change of seasons. By following these guidelines carefully, I truly believe that one should be able to cultivate bonsai of superior quality. In conclusion, creators will be able to present their artistic philosophy and personal style through Chinese Pistachio bonsai.